Visiting the inspiring studio of a local artist. Entry to our friend’s house. 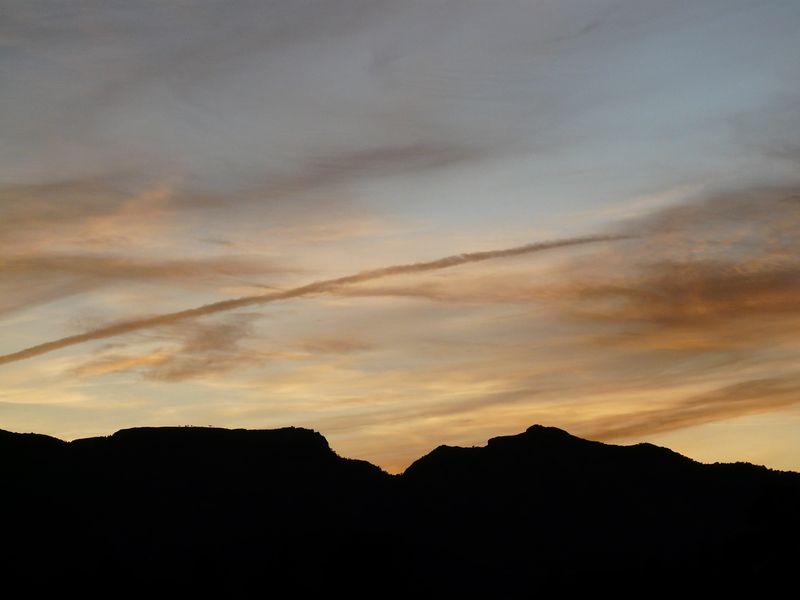 Talk of fitness … my son ran every morning 5am miles into the hills above Gualchos to catch the sunrise.. I enjoyed a week-long break, based in Gualchos, uphill from Castell de Ferro, Costa Tropical, visiting a friend I had not seen for some time. My son accompanied me, a rare treat, since his time is generally tightly booked with work. The mountain villages in this part of Spain have a simple charm that appeals to me. They attract strays, artists & creative souls, as well as gentle dogs & cats. During the summer months, swarms of starlings arrive, seeking trees and church towers. Their acrobatics are inspirational. And then, of course, Granada … my second visit to the amazing Alhambra Palace and its beautiful gardens. The night of Saturday 23th of June, as is tradition in Spain, fires are lit all along the beaches in celebration of Saint John the Babtist. We enjoyed them at Castell de Ferro’s beach, crowned by a waxing moon. One of my obsession is finding small washed up stones of all colours and shapes, including heart shapes. We even watched last Monday’s 2:2 Spain against Morocco’s world cup football game on a TV screen in the local Plaza of Gualchos, where villagers gathered for drinks and cheers. There were additional friends I would’ve loved to visit … thank you ‘Albi’ in Baza, thank you ‘Malcolm’ in Nerja. I plan to make space to meet you next time. A big Celtic Hug to Binah for accommodating us in her lovely home. I sooo needed this holiday. For now I’ll let the rich patchwork of impressions settle. Flying is always a pleasure for me, being enamoured with clouds. But how land and sea are re-framed from the sky adds a surreal perspective on life. Now I must make good on a long-held promise – properly learn Spanish. Oh, and in case you missed it – I started a Patreon site. 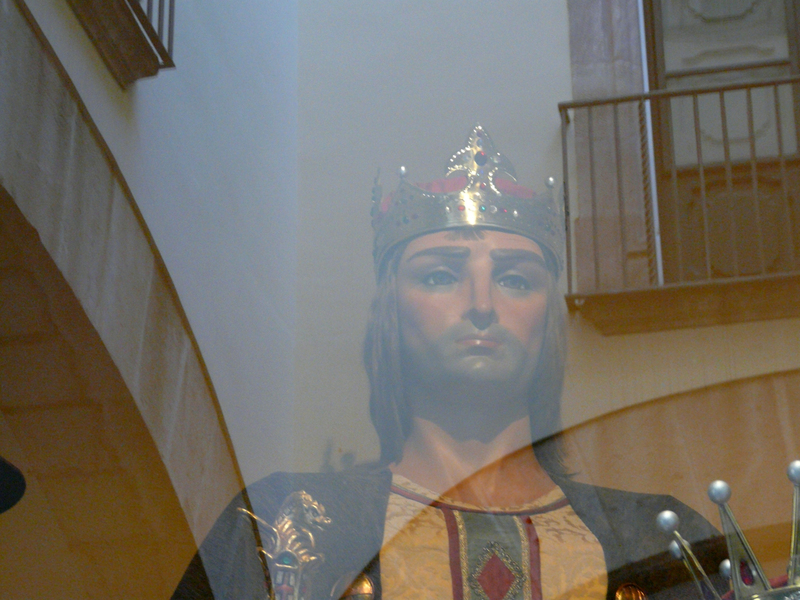 This is the fifth and final part of a short story inspired during a recent visit to Spain. If you enjoyed the read, and are so inspired, please leave me some much needed feedback in the comment section. I’m happy to return the favour, and will soon do reviews again. If you have come here for the first time, you might want to scroll down the home page to get to ‘part one’ of the short story, posted on April 30th. Thanks you dear readers who followed the evolving narrative, and those of you who left comments and/or pressed the ‘like’ button. I’m still learning how to operate this site, but this is post no 80 since I started this blog last April … hurrah! And I have another reason to celebrate. A dear friend helped me today clean up the first three chapters of my novel, Course of Mirrors, a final leap towards sending out queries. No more excuses. … The weight of my revelation receded like a wave sucked back into the sea. Confused by the señora’s flat response, I latched onto the distraction of soft paws resounding from the spiral stairs. Abu, the dog, poked his head through the opening to sample the mood. Neck tilted, he sneaked towards me and pushed his wet snout into my lap. Touched by his show of affection, I stroked his pelt, at which he burst into a whirling dance, trying to catch his own tail. Abu’s antics dispersed the static air around my chest. I cried and laughed in one. I flinched, recalling my own painful miscarriage, when a river of hormones came to a drastic halt and left a dark hole in my body, like a consuming abyss. I had other children, who thrived. Though my past held secrets, it never detained me from living, unlike the señora, whose child was held captive in the tabernacle of this studio. ‘Oh dear, we must apologise to the agent,’ she said. I begged her to stay on, offering a lift to her hotel later in the day. The senora accepted, which freed the agent to drive back to town. His wide grin showed he was happy my break-in had been absolved, and I had made friends with his client. Alma was her name. Alma Ruiz Gonzales. First, we opened all shutters of the studio to let the sun in and more – a peculiar hint from heaven. Light coming from a far window hit a round mirror standing at an angle on the wall. The reflection in the glass rebounded to cast a circular sunspot on one of the paintings, framing the cardinal with the girl sitting on his lap. Alma shrieked – with excitement, struck by a sudden idea. With her dazzling crown of hair she looked like a crazed woman as she rummaged in a toolbox. In triumph, she held up a Stanley knife. I thought for a moment she was going to lash out and slash the painting. Instead she found a sharp pen, marked the lit area on the canvas, cautiously inserted the knife, and began to cut with small sawing movements round the curved line. It may have been poor eyesight, but it seemed as if she put her ear to the cleaving sound of the blade. Her lean and leathery hands nudged along with amazing precision, until the severed circular shape could be lifted from the canvas. Her dedication was riveting. Moving on to the second painting, of the cardinal with the snake in his lap, she cleanly sliced out another circle. Both canvases now had a hole large enough to crawl through, edged only by the backdrop of lavish chandeliers, a facet of the cardinal’s scarlet skull-cap and his polished shoes. ‘Why waste good frames?’ she said. I shook with laughter, bringing Alma to the edge of hysterics. She slumped on a chair to clutch her belly. Our unrestrained mirth thoroughly cleared the air of any lingering ghosts. I suggested we eat something. Alma opened the backdoor to an enclosed courtyard adjoining the semi. She wiped clean a bench and table, while I fed Abu more of my chocolate and prepared a snack for Alma and me. We had our meal in the yard and chatted about mundane things, like the weather, and neighbours. I poured us some Merlot. 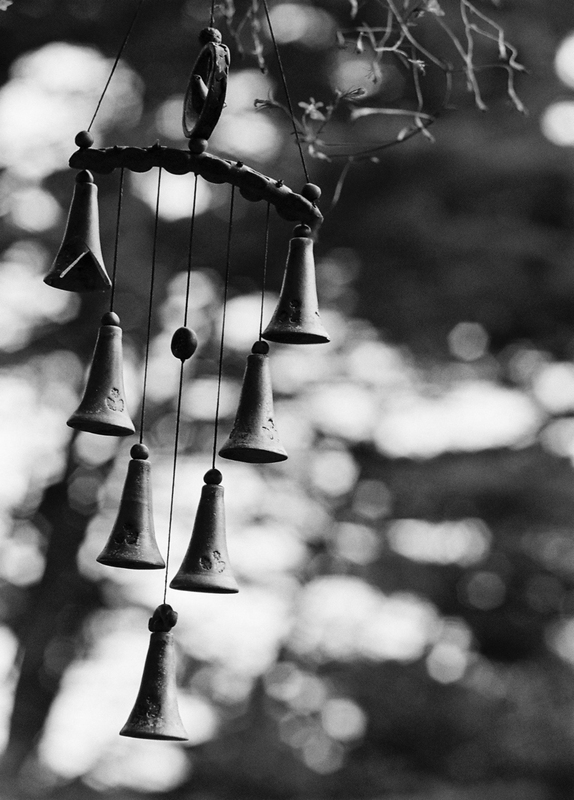 During an isle of silence, the chime bells in a nearby branch moved to a breeze. The melodious ring unsealed more tragedy. Alma shared she had given birth to an actual child, from Antonio, a son, who was stillborn. Mother, Son and a not-so Holy Ghost, I thought. There is no end to the novel ways we make sense of what happens to us. And until we mourn our losses and move on, the meaning we give to what life throws at us could be right, or wrong. After our meal we went to work. During sunset, the art world was impiously deprived. The cut-out centrepieces of two magnificent paintings, depicting a cardinal’s obsession, were released into the ether. The fire was moderate, and held in check by a bed of stones. Leaning on her cane, Alma watched the flames lick at the snake and gnaw at the flawed beatitude of her abuser. ‘May his soul find peace,’ she said. The historic aura of the paintings mingled with the cooling air in the hills of Granada and rearranged the past. Brilliant purple, white and scarlet paint simmered and charred, turning canvas into a crumbly leaden tablet with white markings that looked very much like a snake eating its own tail. The fourth sequence … not the last yet … if you like to read the whole story so far, scroll down the page to part one. She faced me, the stranger mirroring her grief. And, as if she craved the occasion to share this burden of her conflict, tears came, unchecked. I helped her to a chair. ‘Esta bien?’ the agent called from the bottom of the stairs, probing, to allay his unease. ‘Toda esta bien,’ she sobbed, ‘espere en el coche.’ She sent the man to wait in his car, and added, to my amazement, ‘Dejame en paz con mi angel ingles.’ I had been called many things before, but never an angel. She pointed to the cardinal. ‘Los Rojos … fue asesinado.’ There was no anger in her voice, only sadness. From what I had read of events during the Spanish Civil War, and the Red Terror, the cardinal must have died a terrible death. 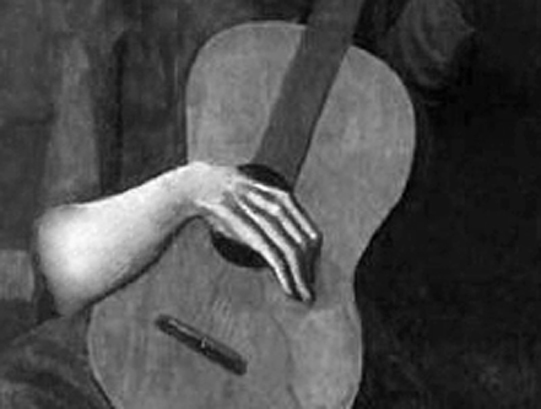 I pulled up a chair and gently touched her back, picking up a dull quiver, as from the neglected body of a guitar that lacks timbre. I had met women and men trying to come to terms with incestuous compulsions, victims and perpetrators, yearning for spiritual love. Some never strike the right note to connect heaven and earth, like the cardinal, a child-man, who sought innocence and destroyed it. On impulse, I held the candle to the woman’s naked image among snakes and noticed what I had missed, the slight bulge of her belly. In my ears rung the refrain – she never existed. Thoughts raced. I had been abandoned, and was adopted. My mother found me in a chapel near Basing. No other woman ever claimed me. A nauseating sensation of floating made me clasp the frame of my chair. St Patrick was mother’s favourite saint. My parents moved from Soho to Hampshire when I came into their lives. Before I knew of my adoption, father once remarked about a streak of Spanish blood in his family, to justify my dark hair. The woman looked forlorn, gazing inward. ‘It’s a dream I must let go,’ she said. Hysterical – comedy and tragedy blurred. She couldn’t even remember the year. The second part of the short story inspired by a recent visit to Spain. As events unfold, I may insert subtle alterations to earlier instalments. The super-dry logs had burned to embers and a threat lurked in the far corner. I conjured up creatures coiled to jump at me any moment. Snakes! Oh no, big mistake, don’t think of snakes. I lay motionless. Blinking, to keep my eyes open, I stared across and beyond the floor to where I thought the thing was hiding. I saw a glitter there. I felt observed. A growl – or was it a lament? My heart thumped in my throat as I reached into my bag for the tobacco-pouch. I flicked my lighter, lit a candle and held it up. Curled on the heap of rags to where I had brushed the scraps earlier was a dog, a slight, elegant creature with short pale pelt. Its wild, not fearful, but contesting this-is-my-territory look fixed on me. Cornered dogs were dangerous, though this one chose the risk. To confront a human intruder takes courage. Water, food, some gesture was needed to befriend the animal. In slow motion I shifted my feet to the ground, unscrewed the bottle of water next to my bed and walked towards the stone-ledge round the chimney where I had dumped my cooking gear. I lit a candle and poured water into a bowl. My movements were tracked for the slightest sign of mismatch. I set the bowl down in the middle of the room and retreated to my bed. Exhausted from the effort, I rolled myself a cigarette. The dog didn’t stir. ‘Come on, the water is for you.’ Ears perked, that was all. Our eyes locked in combat – a staring test. ‘What do you want?’ I got up and broke off a piece from my bread, added a chunk of goat’s cheese and placed the morsels next to the water. Back under my blankets I prepared myself for a long wait. From outside came a bark. My visitor growled. Company was unwelcome. There must be an opening for animals to slip in to the house. Tomorrow I would camp upstairs and close the door on me. Tomorrow was a long way off. My thoughts drifted to Cora, the puppy that had been given to me for my tenth’s birthday, a spaniel. Neighbours adopted her when my father died and we moved into an apartment. Cora liked chocolate. 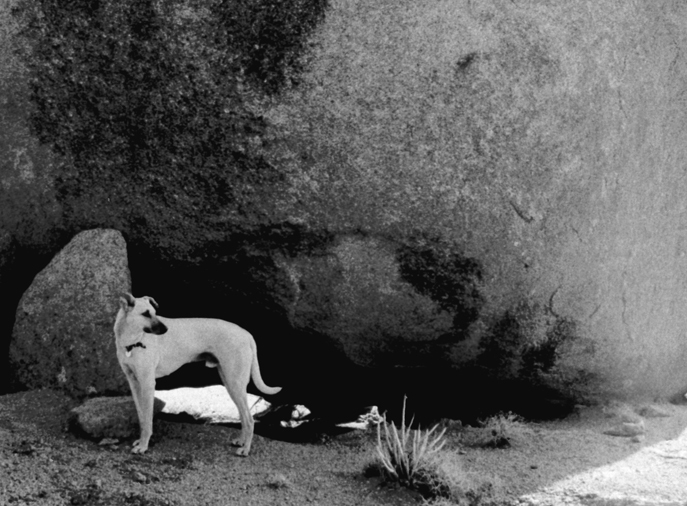 A slight thud – snakelike, the dog slid along the floor towards the offerings. Outside another bark broke the silence. My friend tensed but kept quiet. Did I think – my friend? After careful sniffing he daintily consumed the meal, and, without giving me another glance, bounced from the room and disappeared. The presence of a dog that had eaten my food was oddly reassuring. I blew out the candle and fell asleep. A chorus of birds signalled sunrise. I glanced to the corner of the room now empty of last night’s visitor. The rags turned out to be a frayed woollen cape and shreds of trousers splattered with oil paint, bringing the mysterious artist to mind. With an urgent need to freshen up and explore I skipped breakfast and made for the stream. 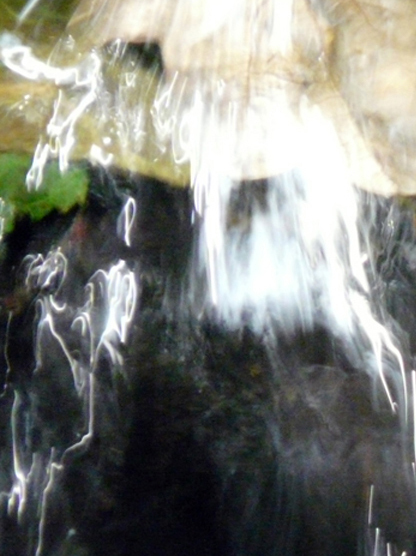 The clear water purled through my hands like liquid gems. I splashed my face and would take a dip later on. Looking back at the house it appeared seamless, as one, but for the bleak air surrounding the semi. There are instances when man-made laws ask for transgression. My state-of-the art Swiss army knife had a screwdriver. I detached the padlock from one of the spider-webbed shutters. Peering into the twilight, there were rattan chairs, a round table, dated kitchen facilities and an ornate spiral staircase near the partition wall, against which was an empty shelf. A snarling – my friend. ‘What’s the matter with you?’ I screwed the padlock back into position. To pacify the dog, I surrendered a bite of my treasured dark chocolate and made sure all food was out of reach on the chimney mantle. While he devoured the treat, I moved across the hall into the rooms adjoining the semi and noticed a shelf looking similar to the one on the other side. My new friend had sneaked up and was yapping. His puzzling behaviour and the coincident of fixed shelves on both sides of the wall in the same position sparked an idea. In the past, my shots in the dark had been rewarding, giving me a certain confidence in areas of the immeasurable. The sound of a rough engine labouring up the hill distracted my musings. Annoyed, I went to check on the intrusion – a banged-up jeep. The local farmer wanted to know what was going on. In my broken Spanish I said I was planning to buy the property and had been allowed to stay here. The furrow between his brows deepened. He waved an arm, ‘Asustado,’ he said. ‘Un momento!’ I ran to fetch my dictionary. ‘Frecuentado por fantasmas,’ he emphasized on my return. ‘Yo no creo en fantasmas,’ I said, standing my ground. He shook his head and forcefully reversed the car. I caught ‘turista estupido’ before the jeep vanished in a plume of dust. So the place was spooked, or neighbours wanted me to believe so. Not that I disrespected ghosts. They gave an edge to my goal, is how I saw it. Part one of a short story inspired by a visit to Spain … please note, all characters are invented. ’No worry, ‘he said during my first viewing. ‘ Solo tiene valor sentimental para la señora …’ meaning, I guessed, the semi-detached part of the house had only sentimental value for the old lady. He was cautious with words, and my Spanish dismal or I would have pushed for more information. By chance, the elderly expat owner of a local restaurant was more forthcoming. The discreet agent had hinted at an unfinished tale. And, as if anticipating a resolution, he promised, ‘You get first right to buy semi,’ stressing it was not a financial issue. Not even a glimpse. Window- shutters were closed and secured. My obvious disappointment and desire to buy made him agreeable to let me camp in the main house for a week. I assured him I would make do with the poor facilities. It was a blind bet, but I wanted to know the spirit of the place. A writer’s dream – the worn two-story house nestling against the hill in the afternoon sun had golden mean proportions that intuitively appealed and captured my heart yet again. There was rightness about this spot in the hills of Granada. I would put my English home on the market as soon as had clarity about this property, especially the wing I wanted included in the sale. One hour of sunlight left. I parked at the arched side gate, turned off the engine and savoured the silence, made exquisite by the murmur of a small stream close by. A familiar inner voice scoffed – the peace will be ruptured if anyone were to occupy the semi. I warned the critic – get lost – and walked round to the front. 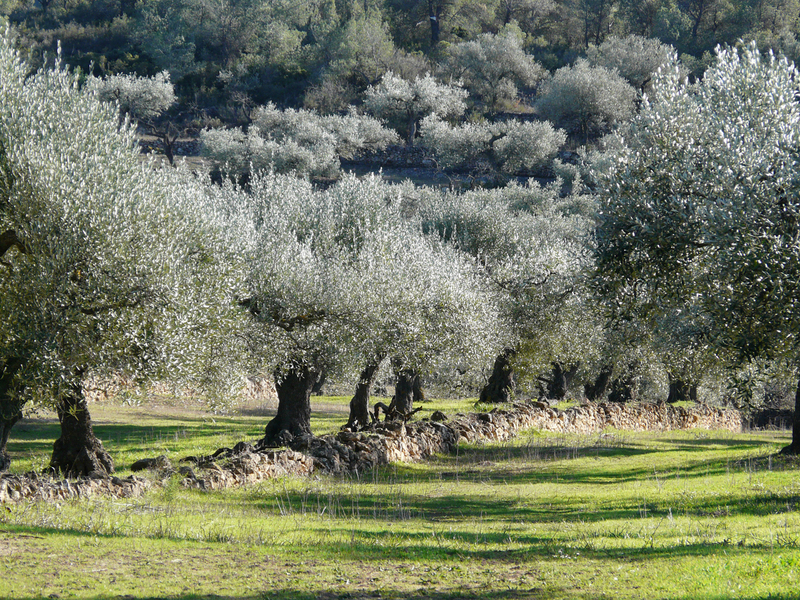 No fancy terraces here, Spanish peasants had worked hard to survive and overcome the prejudice against olive oil. They would have found scarce time to laze and adore the gnarled trees, their crowns iridescent like clouds of dragonfly wings against the slanting rays of the sun. Beyond, the south-western valley filled with muted light. I would build French doors and a balcony to the upstairs bedrooms, providing a covered porch below. The design was clear in my mind, down to the wine and fig plants growing up the posts. And a dip further down the slope was asking for the purple rain of a jacaranda tree. I already saw myself sitting under the porch, writing my next novel. Work to be done before nightfall. I let myself in to the hall and opened the window in a front room that had a large fireplace. I gathered an armful of kindling from the olive orchard and set it alight in the hearth. First victory, no bird nests blocked the flue! I brought in chunky logs from the shed and stoked up the fire. Before getting food and bedding from the car, I swept dust and litter into one corner where there was already a pile of rags. Once I had placed candles all round and set out generous amounts of my favourite Japanese incense the room was transformed. With a little bread, cheese and a bottle of Merlot, I sat out front on a rock to watch the hills sharpen to black topped by luminous purple. My desire for change was urgent. I felt overwhelmed by excess information, excess communication and excess demands, having lived in one place for far too long. But what was I doing here, in this desolate spot, discounting the probable myth of a Spanish ancestor, what was I seeking to unearth through solitude? Inside, the fire glowed and crackled. I pushed an old table to the window and sat on a rickety chair looking up at the darkening sky. The empty page of a notebook remained just that, empty. Grimy walls swallowed the light my sea of candles might otherwise have reflected. I grabbed a blanket and went outside. With only a faint sliver of moon, the brilliant copula of stars dispersed my fussy mood. Yes, I wanted solitude, the rawness of nature and an open link with the cosmos, vast space to connect up the most vibrant threads of my life, to create stories that made sense. Instead of spinning more silk, I was going to weave inspired tapestries. 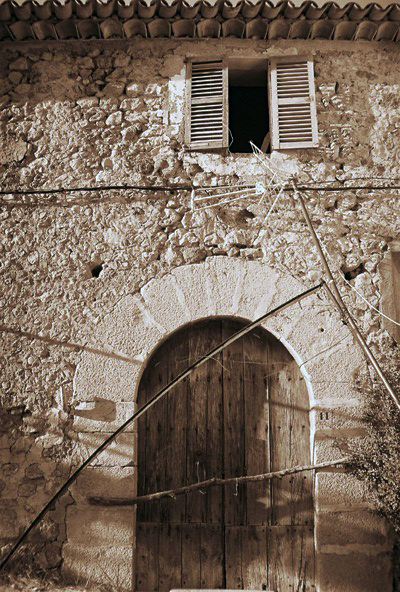 I locked the outer gate and, from habit, left the inner doors ajar. Bliss – days ahead with no junk through the letterbox, no e-mails, no obligations – a week of reflection and tranquillity. I unfolded the camping bed, arranged my blankets and blew out all candles. The glowing logs cast a ring of mellow light. Images returned, from today’s hectic shopping spree for my survival kit. Sleep did not come. The warren of empty rooms played tricks on me. What had possessed me to come here alone? Twisting shadows pranced across the ceiling. I shut my eyes, imagining the colours and fabrics I would transport here to soften the place. In rural Spain the young people leave for the city to chase the future. Houses crumble in the hills where the past is guarded by the older generation, or so it seems. When families shrink the olives stay where they drop, and nothing sells without a brand. Some brave souls, like my friends, Harold and Agnieszka, return to the land and make self-sufficiency into an art form – a beautiful ecological haven where water comes from a well, food from the land, and the sun’s light and heat is captured to provide under-floor heating, as well as casting an iridescent haze that cheers the heart and bronzes the skin. Total calm descends during late afternoons, when the sky becomes a canvas to all colours and darkens to night, sparkling with deep layers of stars invisible to the city folk. In the blink of an eye the world appears again in a new gloss of day. Harold pondered on the slow, enduring movement in circular time, recalling the other life we all know too well, where the measure of things completed is treasured before we rush on to the next project. 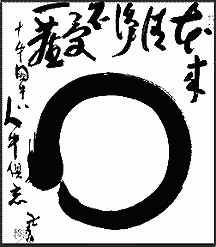 Both qualities of time, circular and linear, have their beauty. 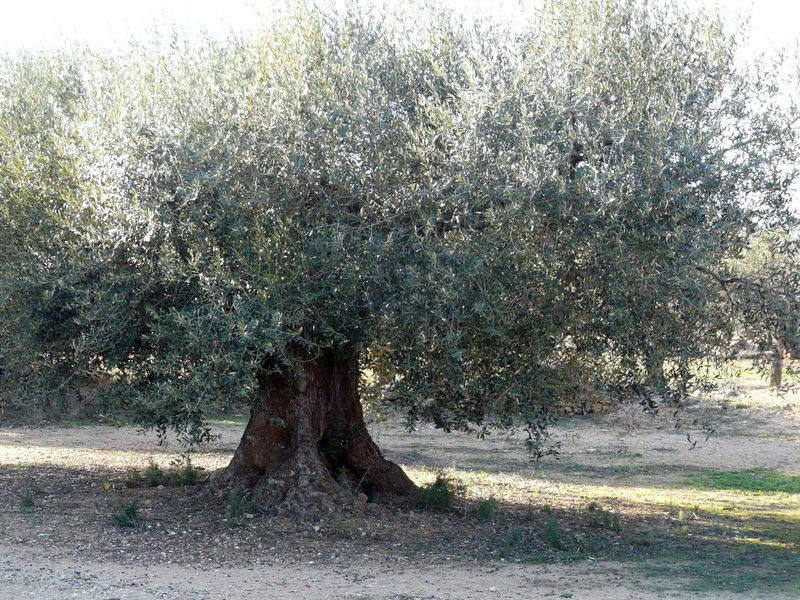 As I walked in the olive groves, a thought popped up – followers follow those who feed them. Could one be neither follower nor feeder (leader)? Would this bypass nature’s law? Like resting at the centre of the grindstone and not be crushed? Would it be living like a beggar receiving what is surplus and freely given? Like where presence alone illuminates the heart in which peace abides blessed by the invisible source. There are such states, tiny escapes, small eternities, in-betweens, unexpected gifts of nothingness, when the world stops to laugh at its beautiful mirage. So here we are, after Christopher Columbus, standing now proudly pointing at the horizon beyond Barcelona’s harbour, while a plane comes in tickling his finger, he who at one stroke widened and shrunk the world with his vision. Would he want to play with this shape and time-shifting capacity? What territories would he explore today? Returning through Gatwick I had a tantrum. I rarely have tantrums. How it happened that I landed in a queue of people who (presumably) volunteered to undergo an iris-recognition-test I can’t recall. This is the future, where you walk through a cubicle and look into a mirror that reads your eyes to establish whether they correspond to the photo in your passport. Each unique individual becomes data enshrined for their lifetime and beyond. I sabotaged the process for several irrational sentiments. Who wants to look straight at their exhausted mien after hours of queuing and ignominies at an airport? I hated the intrusion – eyes being the mirrors of the soul – and, I figured, thousands of jobs will be lost since scanning passport and eyes alone will herd the masses along. I found myself in the cubicle avoiding the mirror, which meant the stupid gate remained closed and I was trapped. The official encouraged me repeatedly to look directly into the mirror … I blinked frantically … of course the gates refused to let me through. Finally I stomped my foot like an angry toddler and consequently was allowed to pass through a human gate. In that instance I powerfully grasped the indignities and the dehumanising experiences so many people had to endure and do so continuously, being sifted by whatever power resides, experiences I was spared all my life. And this is me, who am normally fairly open to new technological inventions. Is this my limit regarding progress, or do I sense an issue here, a host of abuses that potentially lie in the wake of artificial eyes … ? What do you think?